The owner of our hotel picked us up at the airport in Guatemala City, and we arrived in Antigua just before dusk. This is a small city (population around 35000) in the central highlands of Guatemala. It has an elevation of 1530 meters, which makes it quite a bit colder than where we came from. During the days it got pretty warm in the sun though, so after getting over the initial shock we enjoyed it a lot. Antigua is famous for it’s well-preserved Spanish Baroque influenced architecture, cobbled streets and several ruins of colonial churches destroyed by earthquakes. It has been a UNESCO world heritage site since 1979. The city is surrounded by mountains and 3 large volcanoes (Volcán de Aqua – 3766 m, Acatenango – 3976 m, Volcán de Fuego – 3763 m). 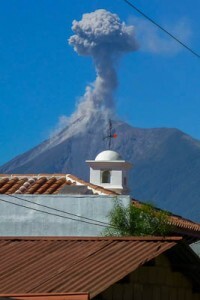 Fuego had its last eruption in 2012 and is still issuing steam and gas several times a day. We did a lot of sightseeing in the city center on foot, and had a 2 hour Segway tour where we also visited Santa Ana and San Christobal El Bajo, two small villages outside of Antigua. Parque Central is the heart of the city, with a nice fountain, benches, street vendors and a mix between tourists and locals. It is surrounded by nice buildings like Palacio de los Capitanes and the cathedral. Catedral de San Josè used to be one of the largest in Central America, but was seriously damaged by an earthquake in 1773, and only parts of it has been rebuilt/restored. The Church and Convent of Capuchinas was well restored and we could see the church, gardens, bathing halls and private cells of the nuns. Santo Domingo Monastery was destroyed in the 1773 earthquake, and part of the ruins are now elegantly integrated into Hotel Casa Santo Domingo. 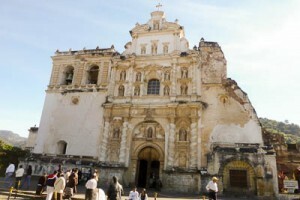 La Merced Church is built in low height with wider arches and columns designed to withstand earthquakes. It has a barroque facade and the biggest fountain in Antigua. 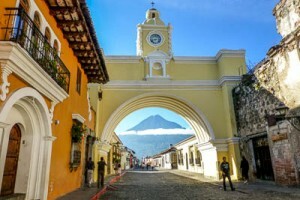 Arco de Santa Catalina is a famous landmark in Antigua. It was originally built to allow nuns to cross the street unnoticed, but now it’s a popular spot for tourists to take photos with Volcán de Aqua in the background. 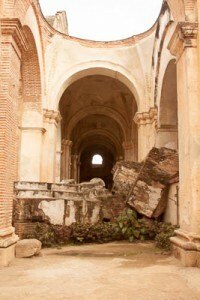 San Francisco Church was also badly damaged by earthquakes but is actually still in use. We visited several nice restaurants and bars, but kept going back to two places. 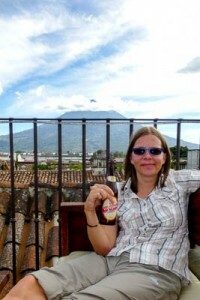 Kafka had a great roof terrace with spectacular views towards the three volcanoes, and we loved hanging out here during the day. The evenings we spent at Hops & Tales, a wonderful little bar specialising in craft beer. 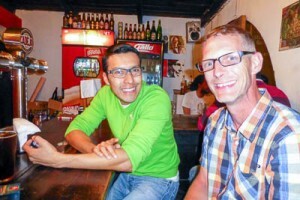 We talked a lot to the owners, Marco and Ellie, and several of the other guests and enjoyed Salvadoran craft beer on tap (Cadejo). They also had beer from two local micro breweries and some other imported craft beers. As the beer geeks we are we asked a lot of questions, and during our first evening there one of the local brewers actually came down to share information about his brewery (Hops & Barley) and beers with us. Since we didn’t really want to leave, we ordered food from the amazing Argentinian steakhouse next door and ate at the bar. The next evening we had been through most of the beers, but the other local brewer (Belgian Brasserie) had brought 4 new ones for us to taste. What’s amazing place!